The biggest mod stories for the week of April 7 2019. Linear Doom is a jokewad which makes all classic Doom 1 levels straightened into one line. 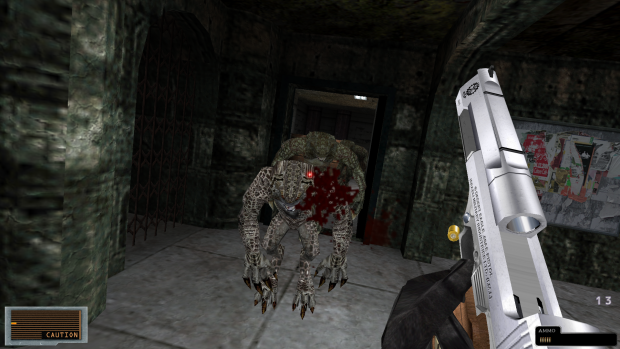 Cold Blood is an online story driven coop mod based in the Resident Evil universe. You'll come across many areas from the games, plus a few original areas you'll have never seen before. Using weapons you thought you'd never use, you'll dispatch dozens of different kinds of monsters from Hunters to Giant Spiders to our favorite deadites, zombies. The Golden Parrot is a pirate-themed Wolfenstein 3D mod with a slight touch of RPG. It takes place in a colorful and original world, embark now! More weapons, improved controls, merchant system, brand new levels, and more... Choose between a english, french, spanish or dutch privateer and get ready for adventure! Yaaarrrr! The OpenMW team is proud to announce the release of version 0.45.0! This release brings yet another horde of bug fixes and several new features, including support for per-group KF animation replacers, 360° screenshots, and the ability to brew a whole stack of a potion at once. Prepare to go back to hell, and wipe it out of bad guys, again Slayer Rampage brings a fast paced experience in the good old Doom and Doom II games, with new guns, monster IA, HUD, Controls and mechanics.